Down these stairs is the quickest way into Flinders Street Station from the popular Centre Place/Degraves Street/Flinders Lane area. The underground Campbell Arcade goes under the road and direct into the station, so (at least when it’s open — which it’s unfortunately not on Sundays) people headed for the station can avoid waiting for traffic lights. 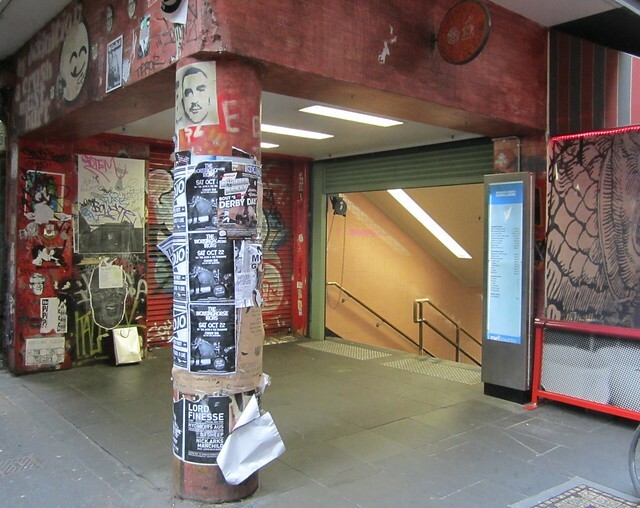 Melbourne City Council has installed a sign listing all the shops in the arcade, but it fails to mention it leads to Melbourne’s busiest railway station. Would it really be that hard to include at least some signage indicating it’s the way to the trains?